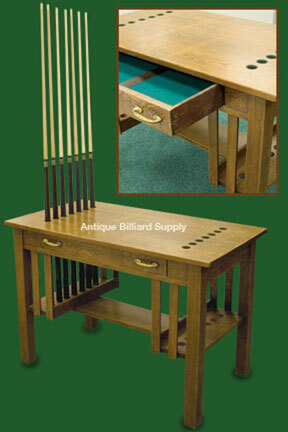 #5-21 Unusual antique cue rack and desk combination. Mission style, solid oak construction. Felt-lined drawer to hold chalk, balls and other game room items. About 22 inches wide, 40 inches long. Original medium brown finish. Holds 14 cues.